The Victory RF Bluetooth Enabled Binoculars are the latest offering from the sporting optics masters at Zeiss. The new binoculars are now available in 8x42, 8x54, 10x42, and 10x54 ensuring that there is a set of these binoculars for any purpose. Victory RF binoculars are outfitted with LotuTec®/ Zeiss T* coated FL lenses and the Abbe-König prism system ensuring that these binoculars offer the highest possible clarity and contrast. 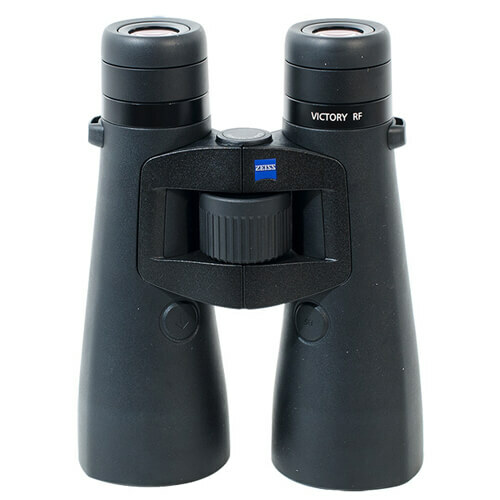 The housing of these binoculars are made from high grade magnesium with a double link bridge. These binoculars aren’t just highly durable, but are waterproof up to 4 meters for 2 hours. If you often find yourself hunting in extreme cold, Victory RF Binoculars have an incredible operating temperature range of -13° F to 145.4° F.
Zeiss’ Victory RF Binoculars are rich with features that make a hunter more effective in the field. The Bluetooth technology in these Victory RF Binoculars allows you to pair up the Victory RFs with your smartphone and use Zeiss’ Hunting App. When paired the Zeiss Victory RF Binoculars and Zeiss Hunting App give you access to a wide array of information, including up to 9 ballistic profiles. Victory RF Binoculars have on-board sensors that measure the temperature and air-pressure. Zeiss Victory RF Binoculars are capable of ranging a target out to 2,500 yards (1.42 miles) with a measuring accuracy of ± 1–600 / ± 0.5 % > 600 yards. When ranging, the results are delivered to the LED display in less than .3 seconds. The Victory RF Binoculars also feature angle compensation, equivalent horizontal distance, and display holdover in inches, cm, MOA, Mils, and clicks. The display LED display has automatic brightness adjustment that adapts to the exterior light conditions.